Read what some of our customers have to say! Just writing to let you know how happy I am with the bedding I purchased. It looks wonderful with the black bunk bed set. Also, thank you for your excellent customer service. I really appreciate you looking over my order. You caught a major error, and prior to processing my order, you called to verify as it didn’t make sense to you. I was glad we spoke, as you were able to get my order rushed. The bedding went on super easy, and there is no “20 yards of extra sheet” hanging down the wall. I love the way it fits. Enclosing a few pictures for you. Thanks again to your attention to detail. The sheets arrived yesterday and put them on before hitting the sack last night. They’re great. The dreaded chore of making the bed in the morning was reduced to a minute or so process. Getting up during the night and coming back to bed was great, no knotted or untucked bedding. Just pull back the covers and get in. My one major concern was dispelled, the sheets being sewn at the foot also lead me to thinking it would be cramped or too tight for the feet causing a claustrophobic feeling. But they add comfort to the nights rest. Hi there Beverly. I got the bedding and love it!! The sheets and comforters are so easy to put on. We had some kids sleeping in there already and I accused them of sleeping on top of the bedding because they had made their beds up so nicely. I was feeling kind of remorseful after I ordered them because they did cost a lot but now that I have them I am so happy I did. They will serve me well for many years to come. Thanks so much Beverly. It was a pleasure working with you! My grandkids love the minky blanket. Very soft. I like it because it stays put. Looking forward to getting the hugger comforter. Thank you. I recently bought a modern, upholstered daybed for my home office. I wanted to use it more regularly as a couch than as a bed and was looking for a mattress covering that would complete that kind of look. I found your site, BunkBedsBunker.com ,after searching many daybed cover sites and struck gold! Your access to hundreds of fabrics, choices of colors, patterns, and custom options is incredible. But most of all, Beverly’s one-on-one assistance was what made the biggest difference. She took the time to discern what I was trying to accomplish (a daybed that didn’t have the appearance of a bed), helped me understand the differences between enclosed covers and 4-corner fitted covers and how they would best fit my situation. She gave excellent advice regarding what fabrics would hold up best for my use and once I chose the right fabric and pattern, she showed me choices for pillow covers that complemented the pattern perfectly. Her help and advice was indispensable in getting the right covering for my daybed – the color, fabric, and look is exactly what I wanted and needed. 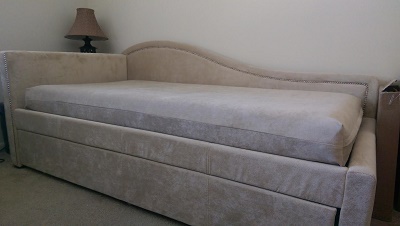 The cover matches the daybed upholstery to a T and creates a seamless, elegant look. Just what I was trying to accomplish! Every time I go into my office and see the “couch”, I can’t help but smile. Just wanted to send you some pictures of our bunks. It’s a small room and filled up with beds so it was tricky to get them all in one picture. 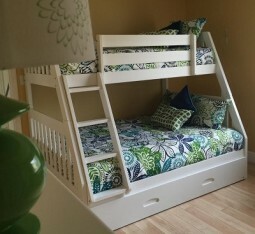 We love the bunk bed toppers! They are cozy, cute, a snap to make, and they wash really well. I love that they are made in the USA and your customer service is awesome. We are some very satisfied customers! Thank you! P.S. Pictured below is my 5 year old daughter, Mary Kate. She has Down syndrome and it is especially important for her to be able to be independent when it comes to things like making her bed. These toppers are perfect for her to manage and she can mostly tidy her covers on her own. P.P.S. 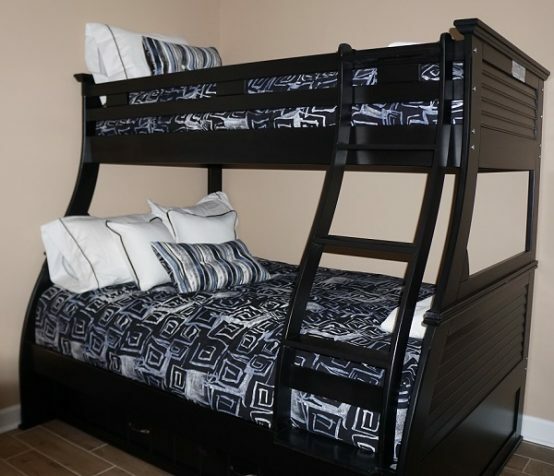 We also have a similar product from Beddy’s on the boys bunks. They are much harder to launder and make up on the beds than the ones we have from you and they cost twice as much. We received the package and the bedding and curtains are perfect! My little boy loves it! The curtains are perfect and his bed finally arrived yesterday. He could not wait to sleep with his new fire engine hugger last night! The quality is excellent and the colors are exactly as expected! Brilliant blue sheets arrived today – thanks so much for the rush job! They appear to be perfect. We leave Georgia in the morning to drive to Detroit to pick up our new truck. Again, thanks. I will recommend you on our trucking page! Just wanted to let you know the sheets are great quality and just what we wanted. Keep up the good work! We received the huggers today and LOVE them – well worth the wait! I checked the label and it was legible (typed) & correct. It must’ve just been a post office issue. Thank you so much for your amazing customer service & fabulous product! I received the new sheets last week and we tried them on my granddaughter’s bed yesterday. They fit great! Thank you for working with me to come up with a solution that fits! Received the very pretty, warm flannel sheet sets. They fit very well on the RV bunks and are so soft and well made. I am so glad I found your place of business and we are so looking forward to our comforters. – Just got our new comforters.The fit is perfect. We like the designs and quality. Thank you for your promptness. I love these products!! Never owned a bunk bed before and quickly realized the top bunk would be almost impossible to make up without these fitted sheets and comforter. Couldn’t be more pleased and would recommend to anyone……….. I highly recommend Bunk Beds Bunker. I bought the Bali Polyester Reversible Fitted Bed Cap Comforter Set and the quality of this product is first class. It does not look like polyester at all and the fabric is so soft that it feels like suede. Before calling Bunk Beds Bunker, I had spoken with another company and the customer service that I received was very poor. For this reason I appreciate so much how Beverly took care of me, having a lot of patience and being genuinely interested that I get the comforter with the right measurements. Thank-you for the kind words. I love this little cabin and your bedspreads are a fine addition! Thank-you for the excellent service and support. Thanks to Denali for making new covers that fit perfectly. We appreciate being able to keep the first set. Lily say’s thanks too. She is your #1 fan. You have been wonderful to work with and I appreciated your help. Of course the pictures can be used. If you can find me some pillow’s I’d be happy to buy them from you. Sorry it has taken some time to get back to you! I am totally in LOVE with my new bunk covers. The fabric is more than I had hoped for, durable but soft. These are exactly what I had been searching the net for. The fit is good and are going to do the job perfectly. Thank you again for all your help, your web address is now in my favorites. We have had family visiting and have been busy. It all arrived and your were absolutely right – it is beautiful. And the perfect colors/design for our Hawaiian bunk room. Thanks so much for your efforts to minimize the shipping costs. I really appreciate it. Thanks for the sheets! They fit perfectly on our 30×70 bunks! You saved us a lot of work. I will certainly be putting this wonderful PR re: your company on social media. I wish you MUCH success. THIS is they way a company should conduct itself. Please be proud and pass this along. Thank you for the quick turn around. It was a pleasure doing business with you! I just got to my home in WV and I love the bedding! As you said I would. Thank you for your prompt shipment of the Journy Huggers! They are beautiful. I have also received one set of the Mayfield sheets. These sheets are amazing as they went on so easily. Customer service was so responsive. It is obvious that Bunk Beds Bunker cares deeply about making their customers’ online shopping experience a smooth and easy one. Just wanted to let you know that I received the bedding and everything is perfect. I especially appreciate that you went above and beyond to make sure everything would fit well and match, especially since this was such a big purchase! I also think taking your advice and getting the slightly more expensive 80/20 sheets was a good decision. Thanks again for your help! I received my comforters and shams and was just delighted. I rarely order on line because things just never seem the same as the pictures. This was more than I expected. They are beautiful. Bunk beds serve a great purpose, but always look messy. Not with your comforters. The room looks adorable and the quality is great. Will pass the word. Also the person who answers the phone is very helpful and pleasant to talk to. Great salesperson! She assured me I would be satisfied and I am. People should know that they do not have to have any doubts about the quality of the huggers. I certainly will be ordering more. I am just thrilled that I took a chance and ordered them on line. Best bedding yet for bunk beds. Thanks. You told me I would love them and I do! The huggers are the best invention ever. They wash up beautifully. The bedding arrived today. I am very pleased with the quality and the colors. It exceeded my expectations! Thanks so much! I will not hesitate to order a similar product from you when the time comes! Just wanted to drop you a note to tell you that I received the comforter today. It is magnificent! My daughter is delighted with the print and the fact that she will be able to make her loft bed each day. It truly has been a pleasure doing business with you and it was well-worth the wait. Your customer service is second to none. I just received my Hugger Set and I LOVE IT!! I have a question: is there any way to buy some of that fabric?? (I’d like to make curtains out of it)???? Also, I would like to order 2 additional EURO SHAMS. I received the bunk bed covers! I love them. We will be heading to our ranch tomorrow and once on, I will send you a picture for your files. thank you! The bedding looks great and the boys love it! It’s a hit. I was wondering if you could send a sample of the California kids Go Girl Paisley to me? My daughter needs a new hugger for her bed as well! I received my order today and I am very pleased!!! Beautiful, quality comforters!! Thanks so much! I received my shipment today and am VERY pleased with the outcome of the product. Love the coordinating fabric as well. Can’t wait to put it all together in my new room. These are not typical comforters that you could find at a big box store. The fabric and quality are exceptional. It’s evident this company has very high standards. And, the customer service is “tops”! Just wanted to let you know we received our shipment on schedule, and we just delivered comforter and son at the dorm. The comforter looks great! We ordered a navy/light blue bunkie. -The color combo is perfect (I always forget how dark navy is! ), it’s cushy, it fits the extra-long mattress just right, and looks tidy, not falling over the edges of the bed. The guys lofted the beds with a school-provided kit, and pulling the comforter around the foot was a breeze, and it stays put. I just wanted to let you know that the hugger arrived early on Friday! It is really nice & we are pleased with the quality. I want to commend you on your great customer service. It does not go unnoticed or unappreciated. You went out of your way to get me accurate information from your vendor & to keep me up to date on the shipping date. I’ve been meaning to email you ever since I received the navy & red bunk bed caps. They are perfect! The colors exactly match the samples that you sent & they look great. Also, they are so much more user-friendly than regular quilts. 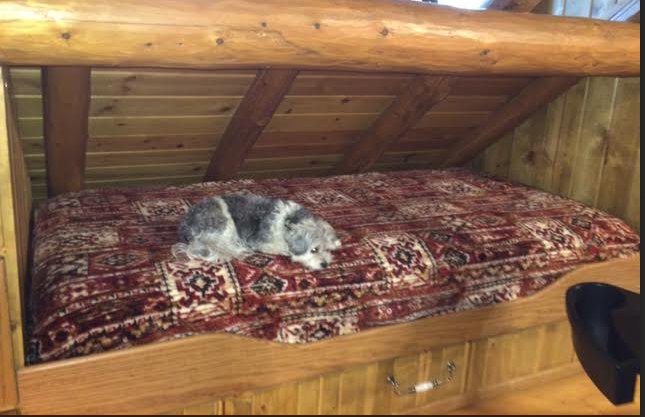 All of my grandchildren can make their own bunks & they look very neat compared to how they looked before. Again, thank you for all the help you gave me during the ordering process! It has been a pleasure to work with you. You have great customer service and a great attention to detail! I got the order! It’s BEAUTIFUL! She supplied extra fabric so I can make my own pull backs for the curtains. I valued being able to customize the order (shortening the curtains and changing the reversible cover color). I hadn’t realized that each comforter is made to order right here in the U.S.A. I love knowing I help put Americans to work. I am very satisfied and will certainly order from you when we replace my daughter’s comforter. Thank you for all that you have done to help us out! We absolutely LOVE our new bed quilts and sheets! I know I will not regret buying the special hugger type of comforter that you sell – it not only looks neater, and is easy for a child to make their bed, but it is also safer, as there are no dangling corners for a child to get tripped up in. Thank you for everything. Your personal help and attention certainly makes all the difference in an online purchase! I did get the bunk huggers. They are very nice and my girls love them. I am so happy with the products and your service has been awesome. I will recommend Bunk Huggers to my friends. ….how refreshing to receive such excellent customer service! Thank you for the timely update on my order. Glad to do business with you!